Leanne used to be a mechanical engineer designing submarines for Lockheed, but left that career to live in Italy for 7 years, then became an acupuncturist and Shiatsu practitioner working with cancer patients, all prior to her current work as a professional artist. These practices paved the way for the fascinating work she does today in the scientific field of color and light therapy and Flow State Training. How Does Color and Light Therapy Work? In very simple terms, when a person is drawn to a particular color, has a favorite color or even finds they don’t want to be around a certain color, it can indicate a number of things about their health and emotional state. This includes knowing when they’re starting to go out of balance, even before they start to get physically ill. For instance, just by knowing what colors someone is feeling drawn to right now as well as what their favorite colors usually are, I can typically determine what they have going on in their life and where they may be going out of balance physically and emotionally as well as how to correct that imbalance. It’s a topic I’ve long been fascinated with and I’ve spent over 20 years studying how we humans respond to color on physiological, psychological and emotional levels and how we can use it for healing. How Did it you First Get Interested in all this as an Engineer? Back when I was still working as a mechanical engineer in California, I took a course on various untapped aspects of the brain, and we did a very eye-opening exercise on color. The instructors put up various colored panels around the room and told us to stand in front of each one and simply notice how we felt while staring at the panels. I was amazed to discover that with each different color, I would experience different physical sensations and emotions. Some of the colors, I REALLY enjoyed staring at; it was like my thirsty eyes were drinking in their color energy! Other colors, however, made me feel nervous or tense or simply want to look away. That was the very beginning of how I realized what a significant impact color can have on our psyche and our being. I left my engineering career, moved to Italy and spent 7 years studying alternative and ancient healing modalities, many of which have a connection with color. Then, several years ago after returning to the States, I went back to school for graduate studies in acupuncture and Zen Shiatsu and moved to British Columbia to get even more extensive training in Eastern 5 Elements. It was during these in-depth studies in 5 Elements where I got a much deeper understanding of how certain colors are linked with different emotions. These emotions are linked with different energy channels (meridians) in our bodies, each of which influences different organ systems. In my healing practice working with cancer patients, I found that simply by asking them what their favorite color was and what colors they were feeling drawn to at the time, I could already start to pinpoint where the root of the physical and emotional balance was coming from and we could start working on correcting that imbalance.. I started making all of these cross-connections between the various ancient Eastern healing systems that I’d already studied involving color as well as linking it all with my studies in Jungian Psychology. Then when I started painting 8 years ago, I started connecting all of this information with how the various colors were showing up in my own paintings. How Did you go from Engineering to Acupuncture to becoming an International Award-Winning Artist? After I had left engineering and while I had my healing practice, I was craving creative, right brain stimulation so I decided to start painting with color. I’d always loved drawing and had taught myself to do so at a very early age, but for some reason, I always drew in black and white, never color. I was really drawn to the idea of getting so far out of my left brained, engineering mind and into a freeing creative flow of expressive energy and it seemed like painting pure abstracts using color would be a good way to tap into that. 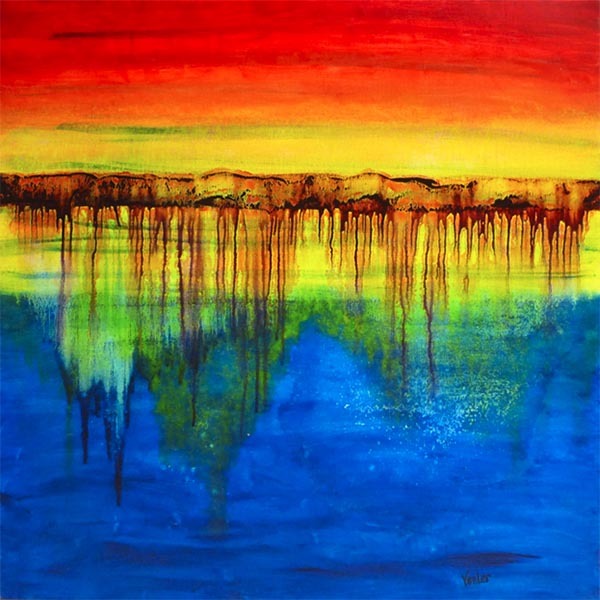 My favorite artists have always been abstract painters like Mark Rothko, Jackson Pollock, Vassily Kandinsky and several others, all of whom use very strong colors in their paintings. As soon as I started creating my abstract oil paintings, I immediately found myself drawn to very particular colors which had the effect of catapulting me into a deep Flow State (i.e. the Zone). Suddenly, without having any prior painting experience whatsoever, I started channeling these very cool paintings… I had no idea where the work was coming from – it just seemed as though something was flowing through me onto the canvas. I showed a few of my very first abstracts at a local exhibition and several of the art faculty members from the local college were in attendance at the reception and made a point to seek me out to compliment me on my abstracts and ask how I had managed to create some of the effects in them. I got so much attention from that very first show (that same night, one of my paintings was also selected for another curated exhibition), that I decided to take a break from the one-on-one healing work and become a full-time artist. Even then, I knew that I wanted to continue sharing all of the healing knowledge that I’d acquired over the years, and although I had loved working with my patients, I intuitively knew that I was meant to teach on a larger scale rather than one-on-one healing. I had no idea how that would manifest, but I knew that it was time for me to focus on my art for the time-being and fully explore that. Within a couple months of that first exhibition, I found a studio and put up a website with my very small collection of completed works at that time. Two months later, I was very surprised to be contacted by an international curator in Italy who invited me to participate in a prestigious international art exhibition in Ferrara, Italy. She had somehow, out of the thousands of art websites on the internet, found mine, felt very connected with the work and wanted me to show some of it in this Italian exhibition titled, “The Spirit in Art”. It was so odd to me, first of all that she had even found my brand new website, and secondly, of the millions of paintings out there, why she had felt so attracted to mine. She felt especially drawn to my very first abstract titled, “Synchronicity” (an indigo and violet diptych that I named for a Jungian psychology term, defined as “meaningful coincidence”). My paintings ended up winning the Grand Prize of the Jury for best art which was very exciting, especially considering I knew very little about painting when I created those. I had simply figured out how to tap into Flow State to channel them. 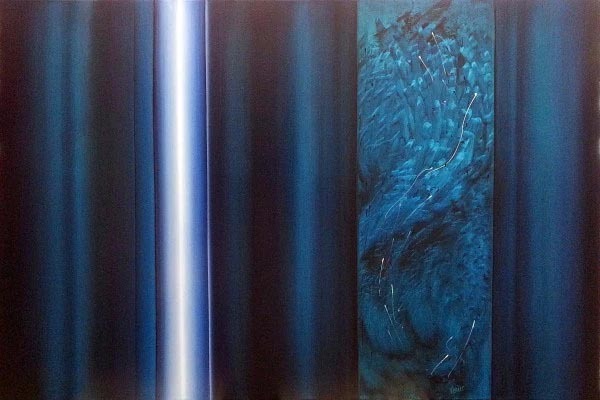 That first painting, “Synchronicity”, is now in the permanent collection of a large global energy investment company and hangs in the lobby of their Hong Kong offices. I’m honored to have several other original paintings in private and corporate collections around the world. That same first year, again, out of the blue, I was contacted by an upscale international design magazine to be their featured artist. They were based in Paris and Lebanon with a 55,000 copy global distribution. This was another strange coincidence since they, too, had somehow found my website and art in the giant sea of the internet. 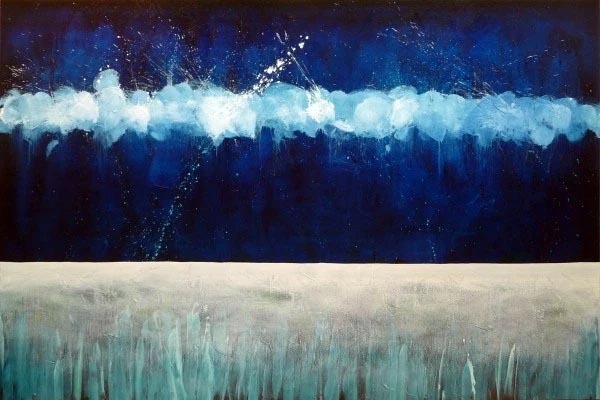 They titled that Featured Artist piece “Leanne Venier: What Lies Beyond a Painting” so they also seemed to be picking up on the fact that I was creating these works in Flow State and channeling something beyond myself. Can you Tell us How People can Know which Colors they Need and what the Different Colors Do? Ok, let’s say “Mary’s” favorite color is usually BLUE. But right now, she’s feeling inexplicably drawn to the color RED everywhere she goes and she keeps noticing Red much more so than usual. Perhaps normally she doesn’t have any RED in her home or wardrobe. In this case, Mary’s attraction to red may indicate a budding health-related issue or it may simply be an early warning sign, telling her that she’s feeling a bit lower in energy than usual, or possibly even a little depressed. Her body knows that RED is an energizing, uplifting color and that simply looking at it will give her an energy boost and a psychological pick me up. Think of it this way, if your body is craving oranges when you’re coming down with a cold, it’s a good idea to give it some oranges since your body knows that Vitamin C will help it recover more quickly. It’s the same thing if you’re craving a particular color — you’ll tend to be more drawn to the colors that will help bring you back into balance physically and emotionally. So it’s helpful to bring some of that color into your home or work environment since it will help you come back into balance more quickly. Do you Have any Real-life Examples of How We Sometimes Feel Attracted to Certain Colors? This made perfect sense to me, because she was already in a fight or flight mode and under so much stress from her current financial situation. Red has been scientifically proven to stimulate the sympathetic nervous system, i.e. it induces a fight or flight state and increases blood flow in your body, speeds up heart rate and gets you ready to run – just like caffeine does. If you’re already tense or under a lot of stress, looking at red can be just like having that extra cup of coffee that you didn’t need. It can make you jittery and even more tense which is exactly what was happening to my friend when she looked at red. On the other hand, if you’re under a lot of stress, calming colors like blue and teal will typically look very appealing to you, like they were for this friend. Blue does the opposite of red and research shows that, simply by looking at blue, it stimulates the parasympathetic nervous system. This means it has a calming effect, slowing down heart rate, reducing blood pressure and giving you the ability to think calmly and clearly. A few months later, this same friend had found a job that she was loving and she was in a much better place financially and emotionally. She came back to my gallery and as she was looking around, she said to me “Oh! 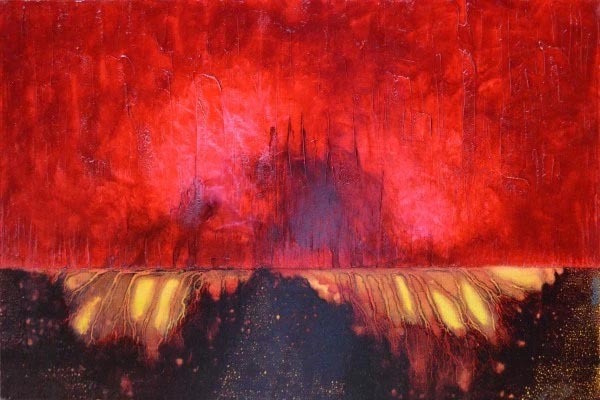 I love this red painting! Is this new?” And no joke, it was the exact same painting she couldn’t even look at a few months ago! (laughing). I reminded her of this and she could barely recall feeling repelled by red back then. This shows how not only how we’re constantly changing but also how little we may be aware of our own responses to color. When you start paying attention to the colors you’re drawn to, you can use this both as a diagnostic tool as well as a way to listen to your body and give it what it needs. We’re always attracted to the colors that will help bring us back into balance, and it’s easy to bring some of those color cravings into your everyday environment. How Does your Art Tie in with your Teachings about the Healing Effects of Color? 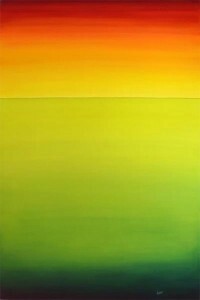 It was through people viewing my art where the teachings about Color and Light all began. That same first year of painting, so many people who viewed my work, either in person or on my website, would come up to me or email me and tell me how profoundly some of the colors in my paintings were affecting them, how much better they would feel just by looking at them and how they literally couldn’t stop staring at some of them. So, with those viewers, I would explain to them one-on-one, how when we’re attracted to certain colors, it can tell us where we’re going out of balance and I’d share how those color energies that we’re drawn to can help us restore balance. Then I would share specific information with them about their particular favorite colors. Every time I’d have one of these conversations, the person would exclaim something like “Oh my god, that’s exactly what’s going on in my life right now!” And they would always want to know more or where to go to read a book on all of this. Within 2 months of doing that, I was contacted by 2 major medical centers in Texas to come and exhibit my healing artwork along with the information about the healing effects of color, light and art and also give a lecture for their medical doctors and students. So that’s where all the teaching about this began, and that’s also when I started bringing in all of the most recent scientific research that’s being conducted all around the globe in this realm. Since I’m an engineer and scientist, it’s always been important to me to understand the underlying science and physics of why these alternative healing modalities work, and also understand the evolutionary purpose behind them. I’ve now read literally thousands of medical and scientific research studies which support how color, light and art literally heal us on various levels and I tie it all together with numerous ancient healing traditions. We can talk more about some of the specific healing effects of different colors. Ok, but First Can you Describe in Particular How People Feel when they View your Artwork? Well, one of the constants that people tell me is how much better they feel when looking at images of my paintings. They almost always feel particularly drawn to certain colors in the works and they often describe how the vibrant colors and the depth in the compositions really draw them in. Some people get into a very deep meditative state by staring at the works and they get swept up in a feeling of bliss. Others see all sorts of imagery in the works, similar to how people see images in a Rorschach inkblot test. Some people’s headaches will magically disappear, others will feel their stress melting away and a calm serenity come over them and an overall sense of happiness and wellness. And some feel more energized and clear after looking at them. 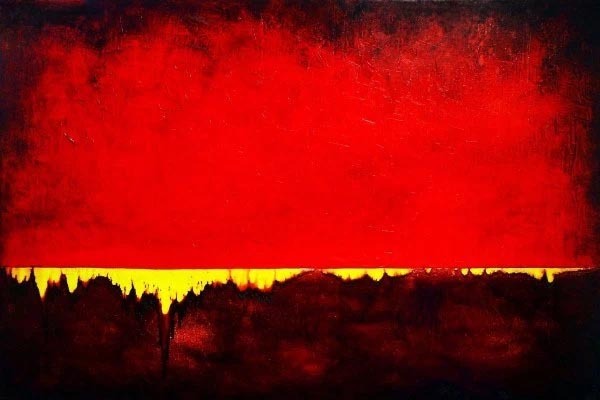 And many have had even more profound healing effects including a woman in New Zealand who healed her eyesight simply by staring at one of my red paintings, ‘Into the Depths’ on her computer screen twice a day. Did These Reactions to your Paintings seem Normal to You? Not at all, in fact, for the first few years, I thought all of these reports were simply people being nice – it just didn’t make sense to me that as a beginner painter, I could possibly be creating something that would elicit such strong responses in viewers. But a few years later as I continued to get this same type of feedback around my paintings, I started doing a bit of research and realized that somehow, by tapping into Flow State during my painting process, I seemed to be channeling some type of healing properties into the works through the colors and compositions that were showing up. And there’s now all sorts of scientific research which confirms that certain types of artwork can actually elicit profound healing effects simply by looking at them. 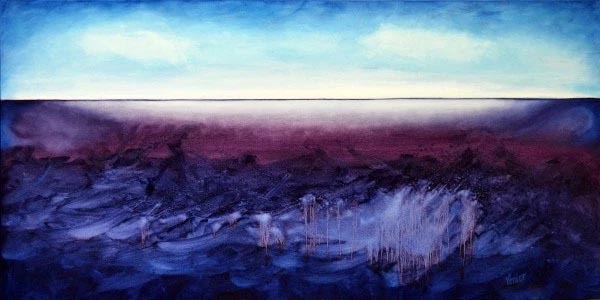 Each of my paintings has numerous thin layers of paint applied over several months (some take over a year to complete). It’s apparently the combination of all of these various colored layers together with the particular compositions that show up during my painting process, that create that sense of depth and the luminous, vivid colors in the completed works. And it’s this combination of color effects and compositions which bring about the healing responses in the viewers. Many people see landscapes or waterscape scenes, although I never intentionally create my works to resemble anything in particular. Whatever shows up is whatever comes through in my Creative Flow Process. I typically have no idea what will end up on the canvas whenever I start any painting session. 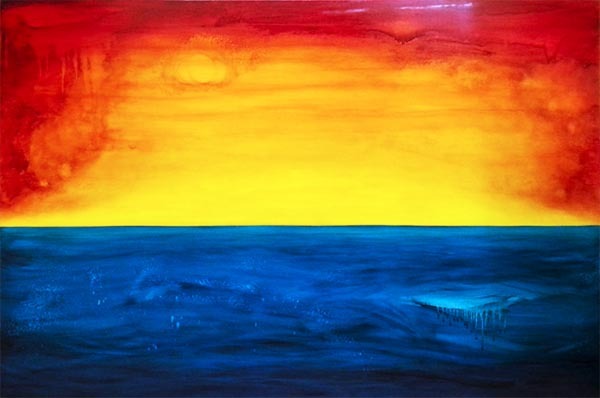 If People Want to View or Buy your Color Therapy Healing Artwork, How Can They Do That? It’s a lot easier now, I’m happy to say! Over the years, I’ve had so many people ask me if they could purchase their favorite painting in a print when they couldn’t afford the original. But I was so busy with the painting, exhibiting and teaching about the healing effects of Color and Light, trying to share this healing information with as many people as possible, that I just didn’t have the time necessary to create and ship the prints myself. So, as a way of sharing the work with everyone who couldn’t afford to buy the originals, I created Free Healing Colors Screensavers of several of my paintings that I could easily share with people digitally. But people kept asking for the prints – they loved the screensavers on their computers but they also wanted to have the art in their homes or offices to enjoy when they were off the computer. I’ve realized that when people ask or pester me for something often enough, I usually figure out a way to respond! (laughing). 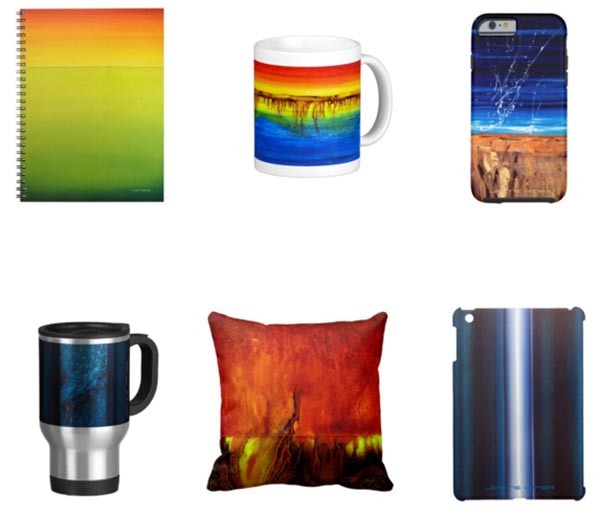 So I finally found an amazing, production-on-demand service where I can create my healing colors art therapy products on a wide variety of premium-quality items including museum-quality giclee prints, coffee art-mugs, pillows, journals, phone and tablet cases and several other products. It’s fun for me to design these affordable, feel-good products with my paintings and now people from all around the globe (even the country of Georgia!) are buying them to have in their homes, offices and on-the-go. And I keep getting positive feedback about them as well as how people love giving them as gifts. It’s great that now I can share my work with so many more people than I could when I only had originals for sale. And I really enjoy when people contact me with feedback or suggestions about products or particular paintings they’d like to see in my store because it helps me know what they would benefit most from or get the most use from. I’m adding new items to the Leanne Venier Gallery Healing Colors Art Therapy Online Store all the time, so if anyone has any requests, they can feel free to contact me directly! Do you Use this Healing Colors Research in your Own Daily Life? Some days I may feel a little sluggish in the morning so I’ll be drawn to my red coffee mug since my body knows I need that extra boost of energy. Other times I may feel very rested, but I know I have a lot of work I need to power through that day, so I’ll still choose red for the extra surge of sustained energy I know that it will give me. Other days, if I’ve been going out too much and I haven’t had enough of my introverted, quiet recharging time, I may be feeling a bit stressed and consequently, more drawn to my blue or teal coffee mugs. Can you Tell us How the Science Supports All of This? The colors in the Red and Blue spectrums have been heavily researched and more colors are being studied all the time. In addition to stimulating the sympathetic nervous system and increasing blood flow and circulation from simply looking at the color RED, as I mentioned earlier, red is also stimulating on a cellular level as all the research has shown. For instance, when you shine red (or near infrared) light on your skin, the red light stimulates mitochondrial function within the cells. The mitochondria are the power-houses of the cell, and by kicking these into gear, the red light will cause wounds to heal more quickly, heal arthritis, cause bones to heal more quickly, stimulate collagen production (i.e. get rid of wrinkles), reduce cellulite, and it can treat muscle injuries or shoulder and other joint injuries. For deeper injuries, you’ll want to use near infrared (NIR) wavelengths or a combination of red and NIR. The longer wavelengths in the NIR can penetrate more deeply than red light alone. They both stimulate mitochondrial function. Near Infrared also stops cold sores in their tracks. All of these treatments can be done inexpensively at home. I’ll be starting a series soon on my blog where I’ll be sharing with readers the different healing properties of all the colors along with the research. I’ll also be sharing my secret tips on how they can find very inexpensive, highly effective light therapy tools for all of the above-mentioned red applications as well as the blue applications below and other colors not mentioned here. I’ll be sharing what the optimal wavelengths for each type of treatment are as well as why it’s unnecessary, in most cases, to spend more than $50 for any light therapy tool. If readers would like, I may even do some reviews on particular products. People can subscribe to my Blog if they’d like to get these upcoming posts about color and light therapy applications. Blue Light can be used for several healing applications, as well. Properly timed blue light is crucial to optimal health and sleep cycles. There’s a lot more about the importance of blue light on my website, but in simple terms, when we see certain wavelengths of blue light during the day, it tells our bodies to be wide awake and shut off melatonin production. This is a good thing when it happens during the day since that tells our bodies to produce more melatonin when we need it at night. Melatonin is a very important hormone in the body which, besides controlling our circadian (daily) rhythms, is a very potent anti-oxidant and prevents all sorts of illnesses including cancer. But we don’t want blue light exposure at night, since that causes insomnia and a host of other health problems. 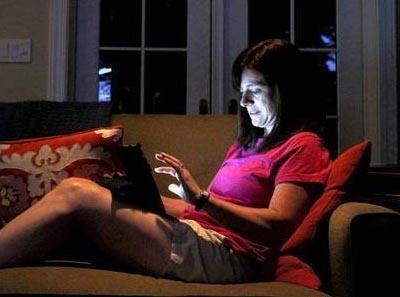 Since our LED devices like smartphones, computers and laptops all emit a high percentage of this very blue light, it’s important to stop using those devices at least an hour and a half before bedtime or use an app that blocks the blue light at night. We can use blue light therapy devices for treating Seasonal Affective Disorder (SAD), reducing PMS symptoms, for resetting our body clock if we’re suffering from Delayed Sleep Phase Syndrome (DSPS) and even use it as an energy boost in the mornings and early afternoons when the typical post-lunch dip occurs. As I said, there’s a lot more information about all of this on my website. 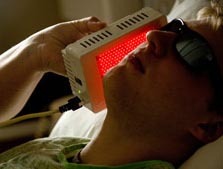 Another common application of blue light therapy has been the hospital standard since the 1950’s. Blue light is commonly used to treat babies with jaundice. You can either leave your baby under a blue light in the hospital, or you can treat your baby at home using a biliblanket. Many people I’ve spoken with have treated their baby by placing him or her under sunlight or in the shade, just as the original discoverers of this treatment knew worked very well. Since sunlight contains blue light within its full spectrum rays, it accomplishes the same thing that the single wavelength blue light treatment in the hospital can do. Blue light is also commonly used for treating acne. Certain wavelengths of blue light kill the acne bacteria when shone on the skin (anywhere on the body). I’ve recommended this treatment to several teens who have completely cleared their acne using blue light. They feel better about themselves, and their confidence levels and social lives have dramatically improved as a result. These are just a few examples of common applications of red and blue light therapy, all of which have been validated by scientific research. And of course there are other colors of light which are also very effective for other applications. In addition to all of the healing effects we get simply from looking at certain colors with our eyes or shining specific wavelengths of light on our skin, there are certain types of art that induce a healing response according to numerous research studies. Not only does looking at this type of art elicit healing effects, it can actually change the chemistry of the body and the structure of the brain so that people have less stress, less chronic pain, lower cortisol levels and lower blood pressure. The following are just a few of the many studies that have been completed. A University of Toronto June 2014 study used fMRI readings to determine that, “viewing certain paintings engages not only systems involved in visual representation and object recognition, but also structures underlying emotions and internalized cognitions,” which means that viewing art literally changes your neural processing in your brain and how you respond to stressful situations. 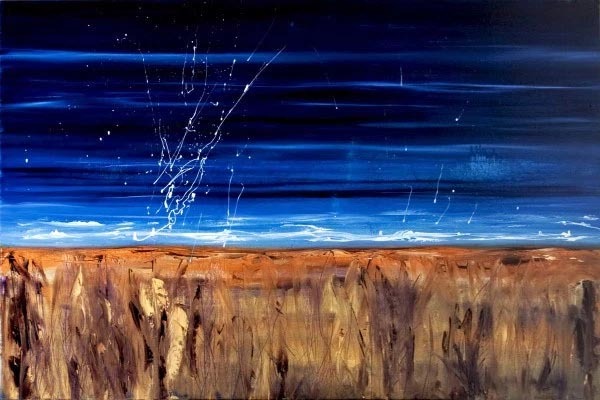 A NASA Ames Research Center study by senior psychologist, Dr. Yvonne Clearwater, determined that the most healing type of art resembles images of landscapes or water and has a great sense of visual depth that draws the viewers into the painting. 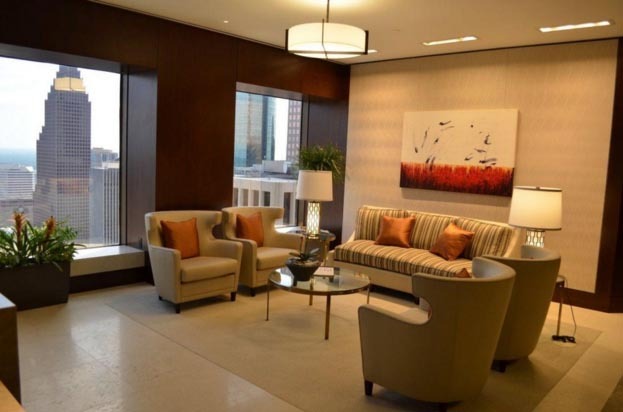 She adds that images of people, animals or buildings are less suited for healing purposes. So not only can people benefit from all of the healing colors found within colorful art, there are actual healing benefits within the compositions of the art itself. And these positive healing effects are measurable in the emotions, the body and the brain. What is the underlying scientific reason that Color & Light Therapy Heals and Influences us on so many levels? Why is Red considered the Sexiest Color according to research? Why are all Fast Food logos Red and Why does President Obama always wear a Blue Suit and (almost always) a Blue Tie? What are the Best Colors for Fall & Winter? What are the Health and Brain Benefits of Creating Art according to scientific research? 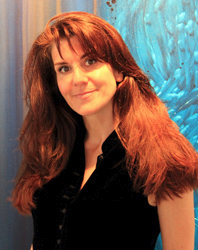 Leanne Venier is an international award-winning artist, engineer, and expert in the science of color and light for optimal health, peak creativity & productivity and for catalyzing Flow State. She regularly lectures about the healing effects of color, light, art and Flow State at major medical centers, SXSW Interactive, MENSA, on television, national radio, international podcasts, and elsewhere. 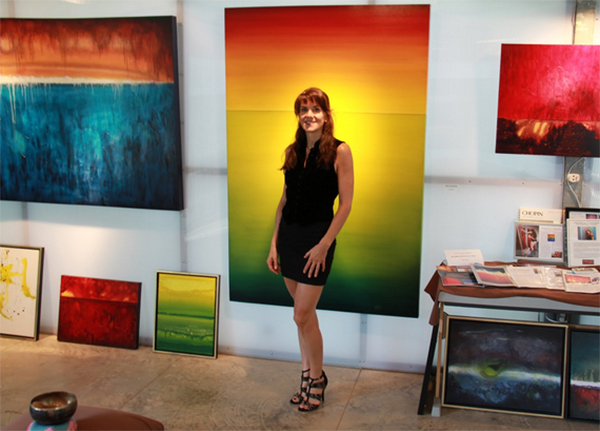 To view her artwork, learn more about color and light therapy as well as her Creative Flow Workshops and Training sessions, visit her Healing Artworks & Color Therapy website: LeanneVenier.com and her Science of Color, Light and Flow State Website: CatalyticColor.com. My favorite colors are light pink and dark royal purple. It surrounds me in my bedroom. But the rest of my home, especially the walls are mostly a clean bright white but one large wall in every room is denim blue with denim furniture and accessories. I know these colors stir positive feelings in me. But I cant explain it.